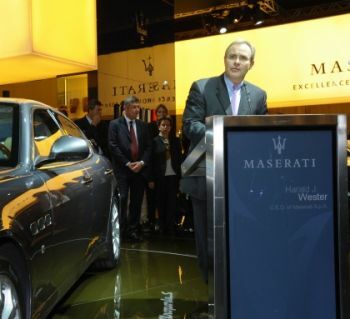 Introduced by new CEO Harald Wester (above) the full range of the new Maserati Quattroporte, which replaces the previous version after five successful years, is currently making its international motor show début at the Paris Mondial de l'Automobile. Introduced by new CEO Harald Wester the full range of the new Maserati Quattroporte, which replaces the previous version after five successful years, is currently making its international motor show début at the Paris Mondial de l'Automobile. After a successful five years with over 15,000 vehicles delivered and 47 international awards received, the Maserati Quattroporte, the model which created the concept of "Sport Luxury Sedan", is now on display with a new look, new engineering enhanced with a new engine. Thanks to the unmistakably skilful touch of Pininfarina, the Maserati Quattroporte has now been honed even further, with a fresher, more modern design that still denotes the class, exclusivity and elegance of a Maserati. Two models are on display in Paris this week: the Quattroporte, with its classic V8 engine (4.2 litres and 400 hp) and the Quattroporte S with a new V8 engine (4.7 litres and 430 hp). Both models have 6-speed automatic transmission, developed in partnership with ZF. The major aesthetic changes have been made to the most distinctive features: the front of the car, with its striking new grille and vertical slats - an obvious extension of the GranTurismo style. The front and rear light clusters have also received a facelift, and now feature LEDs. The side view mirrors are also new, with a more aerodynamic shape and fitted even more seamlessly into the doors. The interior features a new centre console with ergonomically-enhanced, better organized controls. The range of navigation systems has also been completely overhauled with the New Maserati Multimedia System. Two new leathers have been introduced for the first time on the Quattroporte S and Quattroporte respectively: Marrone Corniola and Sabbia - a reinterpretation of the beige already on offer. The launch of the GranTurismo S in March this year, following the established success of the GranTurismo, resulted in the Maserati coupé being delivered to approximately 3,700 customers worldwide during the first eight months of 2008. The new engine of the GranTurismo S, the ultimate expression of the Maserati sporting style, is a V8 4.7 (323 kW) capable of 7100 rpm. The electro-actuated transmission with fast MC-Shift guarantees smooth, fast gear changes. The transaxle gearbox architecture ensures weight distribution with 47% on the front axle and 53% on the rear, which adds to the car's smooth handling and sportiness. The exhaust has a sporty design and sound. The braking system, developed in partnership with Brembo, features front brake discs made with dual-cast technology - a dual casting of cast iron and aluminum, paired with aluminum mono-bloc 6-piston brake calipers - also a feature of the new Quattroporte S. The performance is groundbreaking: acceleration from 0 to 100 Km/h in 4.9 seconds and a maximum speed of 295 Km/h, the highest ever reached by a standard production Maserati. On the outside the Maserati GranTurismo S is distinguished by a number of aesthetic modifications that, although discrete, are highly effective and serve to make the car body appear even sportier without abandoning the neatness of the lines masterfully designed by Pininfarina. The integrated spoiler in the boot lid and the new-design side skirts help to improve the flows around the car. The radiator grille and headlight casings are black. The Trident on the grille and the oval badge below the hood are embossed in red, in true Maserati racing tradition. The interior upholstered in Poltrona Frau leather and Alcantara (used for the steering wheel and central part of the seat with the option to extend to the whole of the headlining) reflect the sporty flair of the Maserati GranTurismo S; the front and rear seats are distinguished by their new dynamic design with horizontal piping on the seats and seatbacks. The Paris show is the first major motoring event following the death of engineer Andrea Pininfarina. Together with Honorary President, Senator Sergio, Andrea spearheaded the renewed partnership with Maserati, which began with the Quattroporte in 2003, to be followed by the GranTurismo, GranTurismo S and now, of course, the new Quattroporte and Quattroporte S. The success story of Maserati's GranTurismo began six decades ago, in 1947, when Maserati presented the A6 GranTurismo styled by Pininfarina. A total of 58 cars were produced. Andrea Pininfarina will be greatly missed by the motoring world and by Maserati. Maserati achieved revenues of 205 million euros in Q2 2008, an increase of 15.8% compared to the same period in 2007. The increase is mainly to be attributed to the excellent performance of the GranTurismo and the Quattroporte, which continues to work its magic on customers. In the second quarter of 2008, thanks to the excellent trend in sales and major cost efficiencies achieved, despite the significant impact of unfavourable exchange rates, the result from ordinary activities was 12 million euros, with 5.9% ratio to revenues. This is a clear improvement on the result of 1 million euros reported for the same period in 2007. In the first half of the year, Maserati's revenues amounted to 398 million euros, up 15.7% compared to the same period of the previous year. The result of ordinary activities for H1 2008 was 22 million euros, with a 5.5% ratio to income - a significant increase on the breakeven achieved during the same period last year. During the first eight months of 2008, approximately 5,900 vehicles were delivered to customers, an increase of almost 40% compared to the same period in the previous year. The United States are still Maserati's main market, followed by Italy. Third comes Great Britain, ahead of Germany and Japan. These markets are followed by China, France, Switzerland, Australia, Arab Emirates and Hong Kong. Maserati has implemented a development plan for the next 5 years designed to reduce consumption and CO2 emissions, and to protect the environment. The designs of recent models have already led to considerable fuel savings. From 2005 onwards, consumption for the Quattroporte has been reduced by more than 20% overall (NEDC combined cycle). The CO2 reduction, compared to the previous Gran Sport model, is 10% for the GranTurismo S (NEDC extra-urban cycle). On the new Quattroporte S with its 4.7 engine, exhaust/evap emissions and fuel consumption have been aligned with future Euro 5 regulations for Europe and LEV2 standards for the USA, partly thanks to the adoption of an innovative metallic matrix catalyzer with perforated sheets (Turbulent PE Catalyst), which is both permeable and reliable but does not affect performance. The use of this solution has evened out the distribution of pollutant particles, reduced pressure, improved resistance to high temperatures and the transfer of gases. Maserati also uses environmentally-friendly, easily recyclable materials made from natural substances, especially for the parts of the interior, which are most in contact with the driver and passengers (natural textile fibers, wood and leather). Maserati cars are mindful of the "design for recycling" concept, which is centered around making cars easy to dismantle at the end of their working lives, so that materials can be identified and separated for re-use. Maserati West Europe is based in Paris and manages six countries: France, Belgium, the Netherlands, Luxembourg, Spain and Portugal, through a network of 13 dealers. In the first eight months of 2008, 488 end customers took delivery of new Maseratis in West Europe, equivalent to an increase of 44% compared to the previous year. 223 vehicles were delivered in France, an increase of 42% compared to the same period in 2007. The Paris area, including Levallois-Perret and the city itself, had the highest concentration of deliveries, representing about 30% of Maserati sales in France.